NOTES: Buy an extra tube of putty! 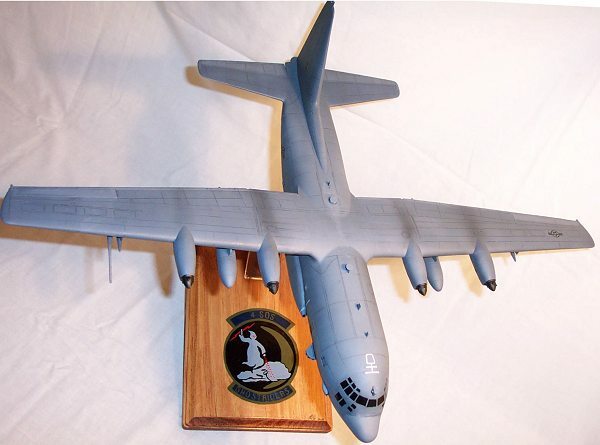 The AC-130U is yet another variant of the C-130 Hercules airframe, this time especially produced for the USAF Special Operations. Commonly referred to as the 'U-Boat', it is the latest in a long line of heavily armed, side-firing gunships. 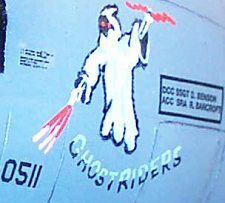 Its official name is "Spooky II" in honor of the first gunship model, the AC-47D, (all other AC-130s are referred to as "Spectre"). The AC-130U Gunship program consists of 13 new Lockheed C-130H airframes, modified by Rockwell, (now Boeing). Although it still uses the venerable Lockheed C-130 airframe, the AC-130U has one of the most complex aircraft weapon systems in the world today. It contains more than 609,000 lines of software in its mission computers and avionics systems! The improved armament and advanced sensors include the APG-180 fire control radar system, GPS, the ALQ-172 Electronic Countermeasure System, an ALR-56M radar warning receiver, an APR-46A panoramic receiver, and an AAR-44 infrared warning receiver integrated with a series of ALE-40 chaff & flare dispensers. The APG-180 fire control radar offers a dual-target attack capability. With this capability, two targets up to one kilometer apart can be simultaneously tracked by two different sensors, and then attacked by more than one of its big guns which include the 25mm Gatling gun, (capable of firing 1800 rounds per minute), a single-barrel, rapid-fire 40mm Bofors cannon, (capable of 120 rounds per minute) and a 105mm Howitzer, (capable of firing 6 to 10 rounds per minute). The AC-130U is also pressurized, enabling it to fly at higher altitudes, above the threats posed by most AAA and shoulder launched missiles. Higher altitudes also save fuel, allowing for greater range than the AC-130H. An inflight refueling capability is also provided. If you’ve been following Operation Enduring Freedom in Afghanistan, you know that this plane has been used extensively to support our Special Forces as well as troops from a multitude of nations. These planes are all assigned to the Air Force Special Operations Command (AFSOC) and serve with the 4th SOS, part of the 16th SOW, at Hurlburt Field, Florida. Essentially the kit is AMT's AC-103H repackaged with an extra sprue for the U model's parts. This means that wings, fuselage, tail and so forth are the H model parts. It also means that extra work is required to revamp it as a U model. 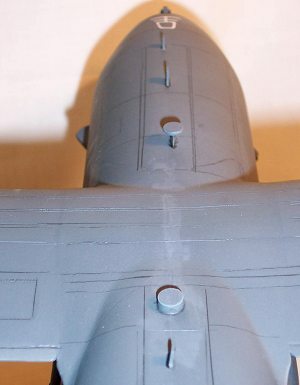 The kit contains gray injected plastic with AMT’s normal attention to panel lines. However, this kit must have been made in Mexico vice Iowa, as there was very heavy flash and monstrous ejector pin marks everywhere. The parts on the 'U' sprue will need a bit of cleaning to get rid of some of the crudeness and you can tell at a glance that it appears these have been added to an H kit. The tail on the U model is different from the H model, so the fuselage must be cut to mate the U model part. In addition, the 20 mm five barrel cannon from the H sprue is chopped to make the 25 mm six barrel cannon for the U model. The big bulbous windscreen of the Hercules is crisply molded in clear plastic. However, the side fuselage windows may need to be taken care of as they are poorly done. Instructions are okay but a bit vague on the exact positioning of many of the parts; especially antennas, vents and the guns. Dry fitting is necessary, or you’ll end up in a sticky spot… (Pardon the pun!) Also some parts are wrongly named, for example the fire control center is called the ammunition box. I started off the kit by gluing together the major subassemblies such as tail, and wings. Right from the start, it’s evident that this will be a huge kit—the size of the tail is bigger than the wingspan of a 1/48 spitfire! The finished kit is about 18” long with a 24” wingspan, so I can’t even begin to comprehend how big the 1/48 kit by Italieri is! While these were drying, I assembled the interior, including flight deck and cargo floor. Construction problems were those generally experienced with AMT kits; the fit was reasonable but needed a bit of extra work to get in place. The cockpit is a simple affair, w/ raised details on the instrument panel, and three simple seats. Then it came time to test fit the cargo floor to fuselage… and NO JOY! I’m not kidding; the thing would not fit on the right fuselage half! The cargo floor was off by over an inch from where it should have met the starboard sponson. Because of this, and a general lack of detail, the interior is close to worthless—the flight deck was so horrendous that I just closed up the doors and painted the windows black. 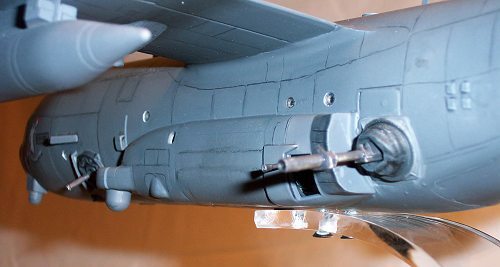 Because the AC-130U is pressurized I figured I could get away with closing the cargo ramp thus preventing me from having to scratch build the entire inside with guns and fire control stations etc… I know—a cheap way out, but I figured I’d save my sanity. With the fuselage together, I began the painstaking process of cleaning up the seams. 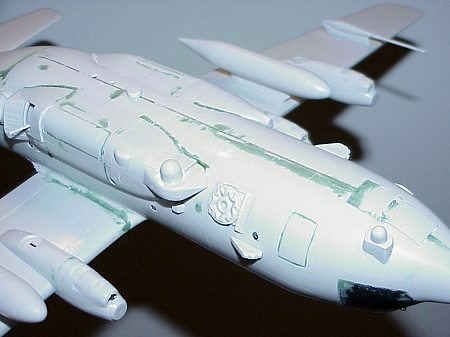 As you can see from the pictures, I used a lot of Squadron’s green putty to fix the seams on this kit. The new tail required to make the kit a ‘U’ variant left a seam that was a bear to hide. So did all the wing seams, the cargo ramp and the sponsons on both the port and starboard side. However, the wings caused me the most problems as far as alignment and gaps are concerned. It took me three different attempts of putty and sanding to get the seams to look right. To display my airplanes, I mount them to a wooden base bought at the local craft store for 99 cents. The base is sanded, stained and urethane finish applied. I use a ¼” sheet of Plexiglas cut 1” wide, which is molded to shape in a pot of boiling water. To mount the airplane to the base, I drill holes in both ends of the Plexiglas, and then screw the plane to the base. When screwed to the wooden base—complete with a hand painted squadron logo on it—it really looks quite sharp. It took me several attempts to learn to do all this before painting the model. That way, if a seam bursts when I’m screwing the plane to the stand, I can fix it without having to redo the paint. There are two sets of decals for the aircraft. They are acceptable, but not totally correct for an AC-130U. The tail numbers are correct for two of the first planes, and that’s about it. 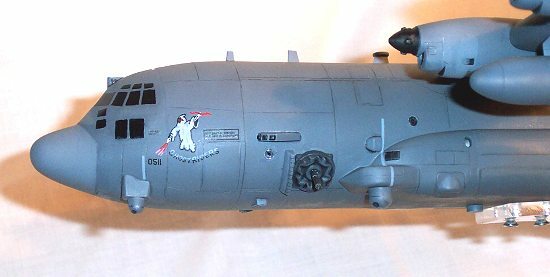 The nose art is not correct for the 4th SOS. I believe they are for the 16th SOS flying the AC-130H Spectre . To make an accurate 4th SOS aircraft, I painted a small version of their Ghostrider character just behind the cockpit, complete with the squadron name underneath. I’ve seen some gunships that are void of all national markings save the tail number (makes one wonder what they’re doing, and where they’re flying! ), and wasn’t too sure of the markings for this particular squadron or aircraft, so I used some markings from the spare decal box. As I wrapped up the kit, I noticed there were a few antennae and tubes missing from the aircraft fuselage. I added a couple of noticeable ones from spares and stretched sprue, although I left off some smaller items such as the Pitot tubes because I was afraid they’d just be knocked off when I shipped the kit to its future owner. In reality, only a crazed gunship fanatic is going to spot the rest. A dilemma I face every time I build a propeller driven aircraft, is how to simulate it in in-flight conditions. To me, just leaving the propellers on isn’t really an option because not only do they not look right to me, but also they’ll also probably be broken when I ship the model to its new owner. Because of this, I usually just mount the spinner sans propeller blades, letting one’s imagination fill the void. This time however, I wanted to try something new. I’ve seen products that replicate the spinning propellers on aircraft, and thought I’d give it a shot. I cut out four discs from clear plastic and attached them to the spinners. Then I masked them and attempted to use my airbrush to replicate the blur of the spinning prop. The spinner, propeller hubs and prop tips are black, while the rest of the propeller is a silver finish. I tried to replicate this as best as I could, but the end result I think just took away from the quality of the kit, (if you look at the photo, you’ll probably agree with me). In the end, I wasn’t happy with my effort, and just used my usual spinners without the props. Overall, this is a decent kit. However, it isn't going to win any awards for complete accuracy or ease of build. I spent roughly 20 hours on this kit, with the majority of it spent fixing the seams. 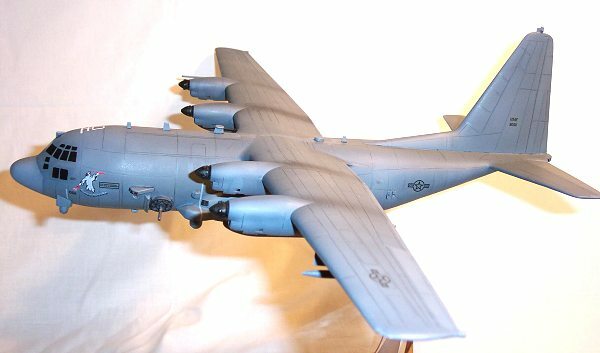 On the plus side with a little bit of effort, it makes a nice representation of an AC-130U, and in a size that isn’t going to overwhelm your display case. If you can find it, and are interested in the little known and covered Special Operations Command, this kit is for you.